Just like anybots, the Texai Remote Presence System allows telecommuters to have an in-office presence whenever they like. Necessity really is the mother of invention. While working on the PR2, a personal robot with applications that enable people to make themselves more productive at home and at work, two Willow Garage engineers needed a more efficient method of interacting and collaborating throughout the day. Dallas Goecker and Curt Meyers, the two engineers, were 2,000 miles apart and were frustrated with conference table phones and video conferencing. So, they applied their knowledge of building battle bots and the PR2 to create the first Texai prototype. Rather than being confined to the table or wall, Dallas now pilots his Texai from Indiana, working and engaging with his Willow Garage co-workers in Menlo Park, California. 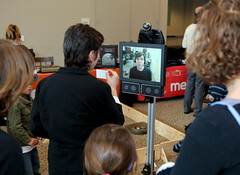 Also just like the anybots, the texai remote presence system isn’t available for sale quite yet. There’s no list of pricing on the site, but if you’re interested, you should contact them at texai-bizdev@willowgarage.com so they can add you to their interest list. Scott Hassan founded Willow Garage in late 2006 to accelerate the development of non-military robotics and advance open source robotics software. Named as an homage to the garages that spawned the computer industry, he envisioned an innovative research lab infused with the engineering expertise of a product development company. The goal was simple: to push the frontiers of robotics, both scientifically and commercially. Scott put together a funding package with the unique goals of impact first, return on capital second, with the strong belief that success in the first goal (impact) would provide plenty of opportunities to excel at the second (return on capital). My first instinct is to laugh. My second instinct is that I don’t like this.